The PTL Club: One of the funniest shows ever? Mark certainly thought so. John Cleese tells a story about the early days of Monty Python’s Flying Circus, when the fledgling series was difficult to catch due to its erratic broadcast schedule. A friend of his from Newcastle managed to tune in one night and laughed at a long and rambling introduction featuring a boring documentarian droning on about Newcastle’s ancient monuments. Only after twenty minutes of the program had elapsed did the friend realize that he wasn’t watching Python. He had been laughing hysterically at a straight documentary feature. That incident occurred over forty years ago, yet it illustrates a strange duality that persists in our media-saturated culture. Only a small percentage of all programming appeals to any particular viewer as genuinely entertaining, a perception that leads us to bemoan the paltry amount of worthwhile broadcasts among an ever-increasing buffet of cable channels. Yes, you really can have 100 channels and nothing to watch. But that is true only if we demand to enjoy shows as they are intended by their creators to be enjoyed. The dichotomy of modern television is that a large portion of it is unintentionally entertaining. This was first brought to my attention when I heard about the TV-watching habits of a friend of my brothers named Mark. He enjoyed a small roster of programs in the conventional manner, but one of his favorite shows was The PTL Club. Apparently he would watch it and howl with laughter, deriving as much jovial benefit from it as he did from the funniest sitcoms. 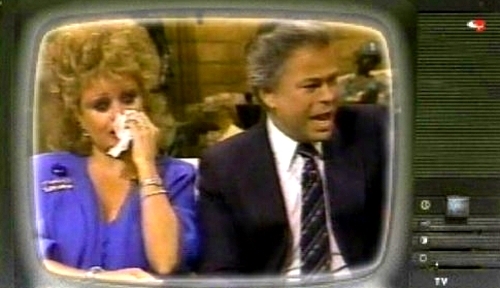 I don’t think he ever made a monetary contribution to Jim and Tammy Faye Bakker, but his love gift would have been justified; their work certainly gave him much joy. Mark’s way of thinking about television broadcasting – that it could be heartily enjoyed in a manner that totally subverted the intention of its creators – was a revelation to me. It opened up a whole new world of entertaining possibilities. It was a revolutionary philosophy that made the very worst of television nearly as valuable as the very best. With Mark’s liberating perspective, it was possible to watch the most embarrassing, cringe-inducing antics of Jerry Lewis during the MDA Telethon and not change the channel. You could endure horribly produced local commercials while appreciating their sheer awfulness. Even the wasteland of public access television could be a goldmine of unintentionally humorous entertainment. One of the first programs I recall enjoying precisely because it was bad was a syndicated children’s quiz show called Bible Bowl. Host Jack Gray was earnestly attempting to evangelize young and old alike with a program that pitted the “Bible Boys” against the “Gospel Girls” in a cutthroat competition of biblical knowledge. Yet I could not help but be amused when the old man selected contestants from the bleachers by spinning around and chanting, “Eenie, meenie, minie, moe, Jesus tells me you should know!” The drawl of the Tulsa-area kids who participated in the show added to the charm. Best of all, though, was the end of the program, when the winning gender ran from the bleachers to devour an enormous ice cream sundae while the losing team was forced to sit forlornly and observe the celebration. Oh, it was terrible – and terribly entertaining. Since then, I have been able to derive plenty of enjoyment from the blandest offerings to hit the airwaves. While on a week’s vacation at a family cottage in Michigan, my wife and I made a habit of adjusting the rabbit ears on the archaic television just so we could bring in the snowy signal of a nightly news broadcast that featured a remarkably unappealing anchor. Each evening, we giggled at the heavy-lidded woman who delivered the news with a complete lack of enthusiasm, as though she were a jaded flight attendant rattling off air safety instructions for the umpteenth time. Whenever we visited my hometown, we took just as much enjoyment in a now-defunct channel that offered nothing more than an unending slide show of local real estate deals. It became our ritual to take in a few minutes of “realty TV” before bedtime, snickering at how it was actually possible to buy a non-condemned home for less than $30,000. These days, I continue to follow Mark’s lead by tuning in to some programs to enjoy them in a manner that their creators would not appreciate. Lately, my daughter Melinda and I have made it a point to catch The Lawrence Welk Show on Saturday evenings. I’ll admit that some of the content is truly entertaining as it was meant to be. After all, good music is good music. But I doubt that Mr. Welk would have been amused by all of the derisive snorts and belly laughs with which we greet the outrageous fashions, cheesy arrangements, and politically incorrect remarks (“Und now, say hello to our little Mexican senorita, Anacani!”) that make the show a total anachronism among the rest of the programming on PBS. Cracking jokes as Bobby and Cissy dance the tarantella, Melinda and I are like our very own Mystery Science Theater 3000 peanut gallery. Ultimately, the key to this kind of enjoyment lies in recognizing absurdity, a quality that is perhaps even more abundant on television than it is in real life. For there is little more absurd than observing people taking themselves and their activities far too seriously, and you can find plenty of that on TV. The sillier the behavior and the more serious its practitioners, the higher the quality of unintentional entertainment. Thus, Bible Bowl becomes great television. A German bandleader’s awkward introduction of his Mexican protege becomes a highlight of the show. And nearly everything about the self-important local news broadcasts has the potential to be funnier than the most popular comedies.